Should You Pay Your Copywriter by the Word? Twitter has been all aflutter this weekend, with a brand new “copywriting agency” following all and sundry. They’ve been promising the untold riches of £0.02 per word and have met with responses ranging from the amusing to the incredulous. @SarahCopywriter £0.04 per word! Ha, ha, ha, ha, ha, ha, ha, (breath) ha, ha, ha, ha, ha! F**k me, the last of the big spenders! But does the problem lie with the sum being offered, or the way that it’s being offered? When you’re hiring a copywriter, should you be paying them by the word? If you want my services, or those of any good copywriter, then you’re best off forgetting the notion of paying per word. Why? Because it’s not the best way to source good copy. The main misconception you have when you’re hiring a copywriter is that all they do is write words. You’re wrong. If all we did was sit at a keyboard and start typing, there’s no way we’d produce coherent and convincing copy. We need to research your industry. Think about your target audience. Before our pens get within a mile of our paper, we need a clear idea in our heads about how we’re going to approach your copy. You want us to skip that bit? You want us to dive in headlong without stopping to think? Or do you want well thought out, well planned and well put together copy that will bring you business? Do You Want Verbosity or Clarity? Do you honestly think that the first piece is worth more to your company? Do you think it’s going to attract more business? Or do you want to reward compelling copy, regardless of how many words it took to construct it? 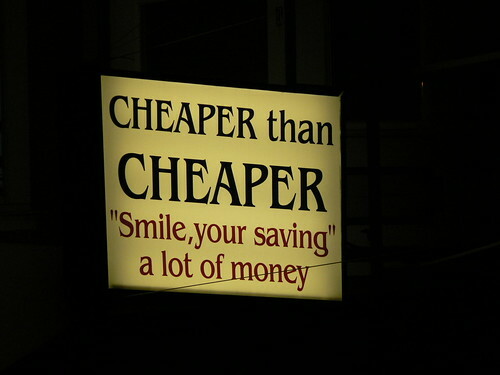 Do You Want to Come Across as a Cheapskate? Numbers are funny things. As soon as a pound sign gets involved, we want to see the highest possible number. But here’s the thing. I won’t sit there and do the maths to work out whether an offer is good or not. If you turn round and tell me that my time is worth a fraction of a penny, I won’t read to the end of the proposal. It’s that simple. If you’re not showing someone the highest possible figure they could be earning, you’re not going to convince them. You wouldn’t advertise a permanent contract as paying “0.0027p per second”, would you? No, you’d advertise it as £20,000 per year and watch the applicants roll in. So How Should You Pay a Copywriter? By now you should’ve realised that paying by the word isn’t the best way to attract a talented and committed copywriter. So you’ll be wondering what to offer. Well the easiest way is to ask your copywriter what they’re expecting. Do they charge by the hour? By the piece? You wouldn’t walk into a garage and tell a mechanic you’d pay him by the number of bolts he tightens – you’d ask him for a quote to do the work you want. Keep your original figure in mind, compare it to the copywriter’s charges and see if you can reach an agreement. Then sit back, wait for your first draft, and congratulate yourself on money well spent. And if you visit the chippy on the way home, take a look at their prices. I bet they won’t be charging you per chip. 17 Comments comments for "Should You Pay Your Copywriter by the Word?" I have had projects paid by the word before, but most of my work is on a project by project basis, because as you say, you want copy that works, not just a word count. I’ll spend time with the client, consulting, researching, revising and working more as a part of the project rather than a hired gun that can type at a fast rate. Thanks for the article – i enjoyed it! Quite agree. I never bid for projects that pay by the word, and I refuse to quote on a per word basis. .-= Ben Locker´s last blog ..Ten words that make readers recoil =-. Hourly rate or lump sum are really the only options for good copy. I made the mistake of accepting pay by the word gigs early in my career, only to find the time spent on the project did not reflect the pay. Ah, the old quantity versus quality debate rears its head again. Another blow against creativity. I’m always dubious about pitching for work with a day/hourly rate. Surely the reward should be in the quality of work achieved, not how long it took you? Maybe it’s just my hangover from days working with accountants who charged in 6 minute units. In my experience, the two are linked. However, I do think that whilst hourly rates aren’t perfect, they do represent the best “arbitrary” way of quoting for a project. Quality is subjective, so not really feasible for quoting purposes. I think this is a good post and raises some points I would like to just throw my 2 pence in, and firstly says thanks for taking the time to write this. The Copify project is very young, we are taking note of ALL opinions and feedback I promise, good and bad. At the end of the day, the project is not to “rip you off” or “de-value” your profession, its to make you money. The website is not holding a gun top your head to make you use it, nor does it force publishers to use the service. However, if some clients like using the website and find it easier to source large amounts of copy quickly, and at a good price, then there is one extra avenue for copywriters like yourself to earn a few quid, but lets get things in perspective…Its not the only avenue, nor the first or the last…use it as a tool. Or don’t use it at all. Its there for you to use and abuse however you see fit. If you can earn better money elsewhere, then good luck and maybe Copify is not for you – but im sure there are plenty of copywriters who are spending more time blogging and twittering out there than actually completing paid jobs. We have a huge “phase 2” wish-list from all the hundreds (thousands?) of tweets and emails we have reiceved, one big thing we have discussed is the price structure, so do please bear with us on this – you may be pleasantly suprised with developments over the next few days, but again, we can add an extra price tier but if publishers do not wish to pay this premium then it defeats the whole point of the website. Both the publishers AND the copywriters need to be happy with the price, we are doing our best to strike this happy medium!! Rob, thanks very much for the comment (and not linking through to Copify). I’m glad you’ve got some sort of plan to improve your service and hope that it means a fairer deal for your writers (and better content for your users). My problem isn’t with your service in particular – but Copify was the issue that sparked the Twitter debate. Cash for words is nothing new, and I’m sure that lots of people use it for a variety of reasons. The issue I and, looking at Twitter, lots of others have is that it’s pretty much a service where nobody wins. As I’ve outlined in my post, clients are leaving themselves open to rushed, sub-standard copy because the money just doesn’t cover the research and time needed to put together an outstanding piece. The writers don’t get much more out of it – low pay and nothing worthy of a portfolio. Someone on Twitter pointed out that if you do any revisions whatsoever for a piece, you’re working for below minimum wage. If that’s the case, you’re not going to want to do any revisions. But don’t think I’m being holier-than-thou and altruistic. I’m not. You see, my day job is in the SEO industry, and every two or three months we have to drag ourselves out of the ditch that chancers offering a sub-par service dig for us. It turns my stomach to think that there’s people all over the world doing the same in the name of cheap, fast content. And that’s not melodrama. About half an hour after posting this piece, I had a conversation with an SEO client who was interested in us writing an article. When I explained I was the copywriter and outlined my process and price – he laughed. When clients enter into the mindset that anyone offering a fair price is trying to rip them off, the field as a whole suffers. Don’t take it personally, but if people are used to getting low quality copy for pennies, they won’t trust people looking for a fair price enough to pay pounds when they’re looking for something better. Context: “Copify” is an agency that sparked this debate. Does it make sense for an agency to make it clear to their customers exactly what they pay their suppliers – especially when the rates are, at very least, questionable? .-= Stephen Da Cambra´s last blog ..Whatever You Do, Remember Your Brand =-. In copywriting fewer words is often better. The less I write, the better it is. 20c a word for 2500 words. $2 a word for 250 words. $20 a word for 25 words. I assure you the 25 words will be the one you use. Seriously though, I can’t see how this service offers any real value. I worked out that, even using the top notch 0.04p rate if I was to take a gamble and assume that I would be classified as a professional, I would have. at best, earned half of my normal rate for a 450 word piece and, worse still, a third of what I charged for a recent time consuming 2,500 website refresh project. Indeed I would have struggled to make the minimum wage on the latter job had it been through Copify. Copywriting should not be priced per word because it is so much more complicated an equation than the simple how long is a piece of string principle. Some jobs in my line of work (predominantly recruitment advertising/communications) are straightforward enough and are priced on a per job basis, but the client is paying for my expertise in a specialist field where not everyone can write decent ads (take a look at any job board for examples of poor ads written, or rather, cut and pasted, by recruiters/clients) . Others, such as the website review and refresh I spoke of are a lot more involved and take far longer and thus are charged by the hour. I am all for any new service that opens up a bunch of potential new leads to writers, but only at a rate that, at the very least, reflects the experience, professionalism and time taken to produce a piece of copy. Where the Copify model falls down for me, and I am sure for many others, is that no matter what example I take, when I work out how much I would have earned using the Copify equation, it makes pretty scary reading. I am not top of the range price wise either. I have held my rates for the past six years and charge less than I myself was paying when I was a ‘suit’ in agencies commissioning copywriting. I’ve also, in these recent credit crunch times, had to sniff around a bit more for work due to some agencies putting a freeze on the use of freelancers and generally managing to keep their writing needs in-house. But, would I consider doing a time-consuming, say six hour, job for a quarter of what I would normally charge? The answer has to be no, otherwise we are cheapening the whole art – and that to me is plain wrong. Hi again guys, thanks for having (what is turning into quite an adult) discussion about Copify. I think Twitter can lead to frustrations as it’s very difficult to get any real sense into 140 characters, so again thanks to Andrew for starting a good debate away from Twitter. Not everyone wants the highest standard, and not everyone can deliver the highest standard. We can’t exclude the businesses who do (however sad it may be) only want quantity over quality. And on the flip side, is it fair to exclude the less experienced copywriters who are willing to make some money supplying this type of copy? Also, if we don’t price per word, how do we price? We can’t price “per hour” as this hourly price will vary for each copywriter. Andrew, you may deserve £50+ per hour, but that’s you. Not everyone has your experience – but we still want to cater for these writers as their is demand they can be involved in. So we need to know the capabilities of the copywriter (hence the “Standard”, “Professional” etc. to begin with) but also how many words are we talking? 100? 10,000? It makes a huge difference to the publishers using the site. The simplest way for the publishers (who have no experience of the copywriter they are about to use) is to pay a fixed price per word, depending on the quality they are happy to receive. If they are happy to pay for low quality copy (hey, its a free world so let them have it) then they pay the minimum, and in turn the copywriter can deliver the minimum. However if they want to pay a premium (they tried “Standard” before, but it wasn’t really what they were after…they need something better) then they pay extra and in turn ONLY THOSE with the experience can accept these jobs. One big issue seems to be the cost per word figures. Please understand this is early days for Copify and these are not set in stone. This is a learning curve for us too and we need the backing of quality, experienced copywriters like yourself Andrew to get to the stage where we are comfortable in the knowledge we can raise the bar, and supply quality , well paid jobs to people like yourself. We can’t charge a serious company top-whack when we have no idea of the quality of the copywriters in the “pool” on Copify – we are not there, yet. Once we have seen jobs completed successfully and have a good system in place to ensure only the best get paid the most, we can increase the prices as we can be sure Copify can deliver the goods. If the job is rejected, it will be reviewed by the Copify team and if it is found that it does not match up to the initial brief, you will not be paid for the job. I’m a client. I’ve paid the bargain bucket fee, and got some fairly greasy chicken. Not too impressed. Doesn’t match my brief, which was edible chicken. Fine. I go for the bigger price, I get my chicken and I go home happy. I’m a copywriter. First article for copify. Yeah, it’s a bit greasy. But hell – if you want good chicken, don’t get drive thru. What’s this? The client’s realised he’s paid a pittance for poor copy? He’s rejected it? I’ve not been paid? I can’t re-do it because I’m not a Premium Deluxe Copywriter? I’ve wasted my time for no reward? Nice. The way I see it, you’ve got two choices. You either devote more time to it than you’re getting paid for, or you don’t get paid. Brilliant for the agency, OK for the client, crap for the writer. What’s my incentive for joining again? I still don’t understand this business premise. Who in their right mind decides that anything other than the highest standards are enough, let alone contracts out their second best wish list to an inexperienced writer they have never met and who knows nothing of their organisation? Surely they’d be better off having a stab at it themselves or doing it by committee? And it’s not as if Copify promises a fast turnaround. A couple of jobs have March deadlines and one of them is for the princely sum of £15.20! I really don’t get the concept. Clients who are willing to settle for second or third best hires inexperienced writers to produce bog standard copy in a ‘when you can be arsed’ timescale? I’d last five minutes with an approach like that. And haven’t People per hour been doing similar, but not just for copywriting, for quite a while? If you pay by the word (especially as low as 3p per word) you are losing out on research and editing surely you need to factor this time in to ensure a quality article! Our copywriters are paid a sum which includes a minimum word content with quote and a seperate minimum without quotes, this sum is evaluated by the subject as if someone were writing about brain surgery more time for research is needed or the content is worthless anyway. Copify has it’s place and some people could do well by it but personally I prefer to pay more for happy clients and happy writers. No, copy writers should be given free reign as to create better quality copy!